The Liberal and Neocon establishment consistently portrays global events through a false lens. We are witnessing this tactic once again recently over the political crisis in Venezuela. What is this bias that distorts perspectives and leads to cries for intervention? The bias is quite simple; it is the unjustified supposition that the US has the right or even the obligation to play the role of arbiter in world affairs. This bias is ever present in diplomacy and in the media. Yet, the premise is patently illegal. Venezuela has been a thorn in US designs for two decades following the rise of Hugo Chávez through democratic elections. Chavez befriended Castro and used Venezuelan State oil revenues to promote socialist policies domestically and anti-imperial movements across Latin America. There were numerous attempts to overthrow his rule. All failed and he died in office. His successor President Maduro has continued those policies. The media has for years portrayed Venezuela as a failed socialist experiment and its leaders as corrupt and/or incompetent. 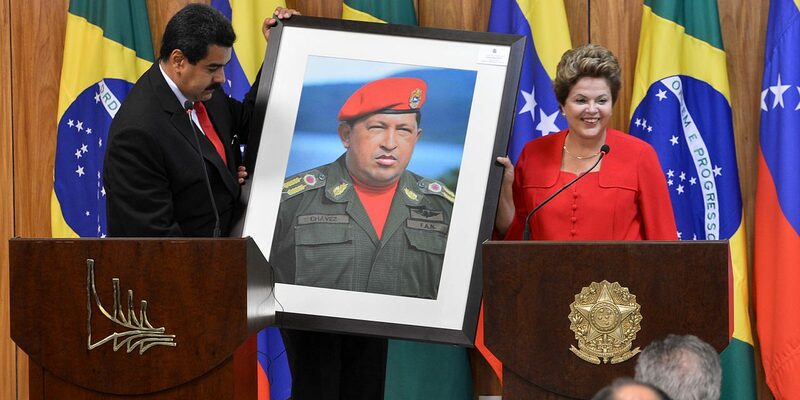 In fact Maduro has been a far less charismatic leader than Chávez. He has also lost leverage and resources due to the decline in oil prices. And he and his government may well be guilty of corruption, although the details of such charges have never been substantiated in the media, which seems to suffice in accusations in lieu of facts. Unmistakably, though, there is now widespread disenchantment domestically with his rule. Now, media presentation and political dialogue in the US have openly called for the overthrow of the Maduro regime. Anyone who resists such calls is branded as a fool, a socialist sympathizer or a Russian agent. Criticism of US policy is quashed. Rational debate is obstructed. The consensus opinion promoted by the Liberal and Neocon establishment is that regime change is essential to avert a humanitarian crisis and to topple a corrupt and unpopular regime. But let’s take a small step back to reflect on the facts of the situation. The US has already implemented economic sanctions on Venezuela. These sanctions have served to exacerbate the problems that originated with failing government policies in Venezuela and the collapse of oil prices. The sanctions that the US has imposed have punished the people in Venezuela with the intent to weaken the Maduro government. Moreover, these sanctions are immoral and illegal under international law. On January 23, a leader of the opposition in Venezuela, Juan Guaidó, declared himself the acting president of the country. And the US immediately recognized him as the legitimate ruler. Recognition of Mr Guaidó is contrary to Venezuela’s Constitution and it is patently illegal under international law. Of course, by pointing out these facts the media chorus and self-righteous opinion leaders will shout me down. They will ask, “Do you support the corrupt Maduro government? What would you suggest, that we do nothing to help the impoverished people in the country?” And this is precisely the bias I am addressing here. The US has no legal right to take the actions it has taken. There are processes (admittedly weak) to address such political crises through the UN and other international bodies. Unilateral action and direct intervention in the internal affairs of foreign countries is not legal. Nor does the US have any moral right or obligation to do so. Perhaps I should add a biblical reference to convince the religious lobby. ‘If Maduro is guilty of mismanagement and corruption, then let the nation that is without sin cast the first stone.’ The US, despite its claims of exceptionalism, is not such a nation. We require a new paradigm for US foreign policy. Policy should not be based on the false premise of an exceptional society that leads the world from a moral high ground. It should not be led by the financial interests of corporate and military lobbyists. The self-righteous cries of liberal voices for humanitarian intervention do not have the mandate to dictate policy. The US must act openly through international organizations and not clandestinely. It has no right to play a role as an arbiter in world affairs. It has been doing so for decades without a mandate. And, it continues to propagate the myth that it has assumed this role reluctantly out of responsibility to an international status quo and in support of democratic freedom and economic progress. Let’s write a new paradigm based in self-criticism and upon international law. This article was originally published at DavidHillstrom.Blogspot.com on January 28, 2019. David Hillstrom was born in the US, but moved to Europe in protest over the Vietnam war. He has now retired from a well travelled career in International Banking. Since then he has written two books, The Bridge, a collection of philosophical essays on religion, science and socio-political themes, and The Story of Our People, a poetic drama. He lives in Athens.